Animal Wildlife | Lion | The lion is one of the biggest and most powerful of all the cats,with the lions body growing to roughly 3 meters long!The lion is currently found predominantly in Africa,but the lion can also be found in remote part of Asia.The Asian lion however,is thought to be smaller than the African lion and numbers of the Asian lion are decreasing rapidly.In historic times,the lion was likely to be found in southern Europe but the lion no longer exists there today.The male lion will only get to about 8 years old,where the female lion have been recorded to live until the lion is 20 in the wild.The lions tend to stay in groups of around 20 lions but only one lion is a male. 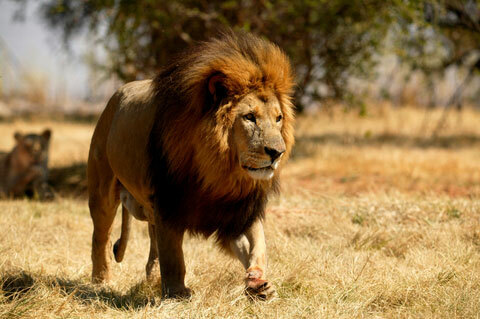 Sadly the few remaining species of lion is seeing a 20% decline in population in the past 20 years. This could be due to the loss of the lions habitat and the hunting of the lion by humans. 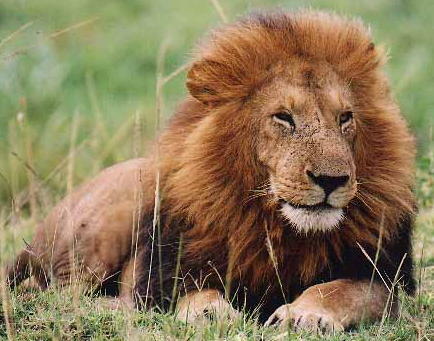 The fact that other animals (such as humans) also hunt more and more of the animals that the lion preys on means that the amount of food available for the lion in the wild is decreasing, which naturally has negative implications on the lion. An adult lion is known to have a roar so load that it often be heard more than a few miles away, despite the fact that lions are unable to roar properly until they are a couple of years old. The lion uses its roar to call to other lions but the roar of the lion also tends to be the first attempt to warm off approaching danger. 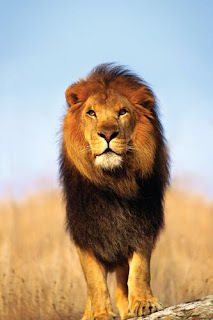 The lion has the reputation of being the king of the animal world although the lion only really eats every 3 to 4 days. Surprisingly enough, the female lions tend to do most of the hunting while the male lion rests. The lionesses have very strategic and well-practiced hunting routines as these female lions need to ensure that there is enough food for them and their cubs. 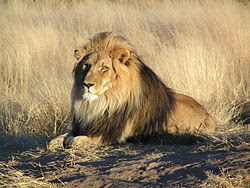 Lions live in small groups called prides that are extremely territorial. 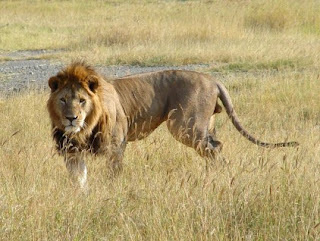 Lion prides will seldom go into each others territory and this means that problems can occur when the animals lions hunt, as animals such as zebra and wildebeest follow the rains leaving very little food for the lions to hunt when the dry season is at its peak. The lion has large paws with soft pads underneath and sharp claws on the end of each toe of the lion. The soft pads on the underside of the foot of the lion enable the lion to stalk and chase its prey with as little noise as possible. The sharp claws on the toes of the lion give the lion more grip when running and also allow the lion to grab onto its prey both when catching it and eating it. The structure of the feet and legs of the lion mean that the lion is able to jump over 10 meters and the soft pads on their feet give the lion a smooth and quiet landing. The lion has retractable claws which means that the claws of the lion do not get worn down easily so that their claws remain sharp for catching their prey and have a dewclaw on their front paws which the lion uses as a toothpick. 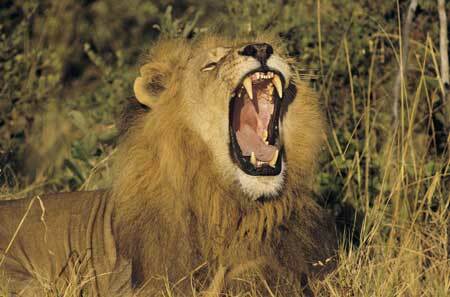 An adult lion has 30 teeth in total which includes four fang-like canines and four carnassial teeth. 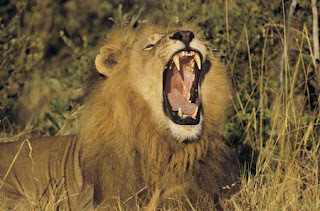 The lion uses its fanged canine teeth for holding onto and then biting its prey and the four blade-like carnassial teeth for cutting through tough skin and meat. The rest of the teeth in the mouth of the lion are conical and are designed for cutting up and tearing the food in their mouths. The lion is not able to move its jaw from side to side like humans can and so the lion only uses one side of its mouth at a time to eat. Lions do not chew their food into tiny pieces but instead swallow chunks of meat whole which enables the lion to eat as much food as it can, as quickly as possible.